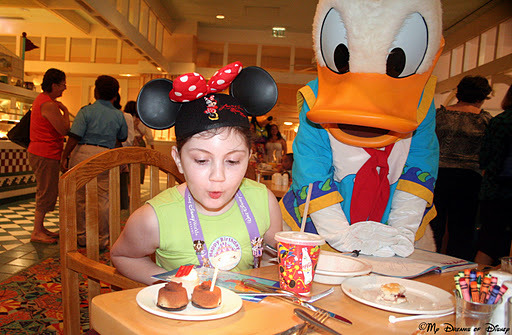 The Disneyland Resort invites you to enjoy all it has to share! Sophie: Hi Guys! Long time no see! Well, today I’ve got a guest with me! World of Disney, meet Mr. Reporter. Sophie: Ok then, “‘Image’ Reporter” every body! On with the interview! 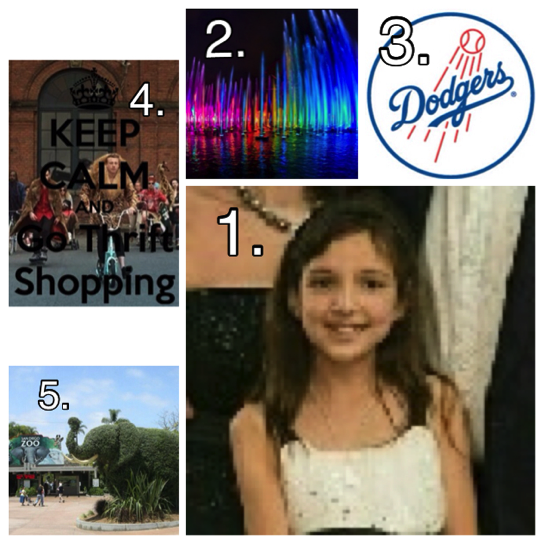 Image: What are your top five hopes about California? Seeing one of my two best friends, Jagan, in person again! Going back to DODGER STADIUM!!!!! Going to the San Diego Zoo! Image: Now, I notice that only one of your top five has something to do with Disney. Why is that? Sophie: Unlike Walt Disney World, Disneyland is small. In my opinion, you could get through every thing the parks have to offer in a day. 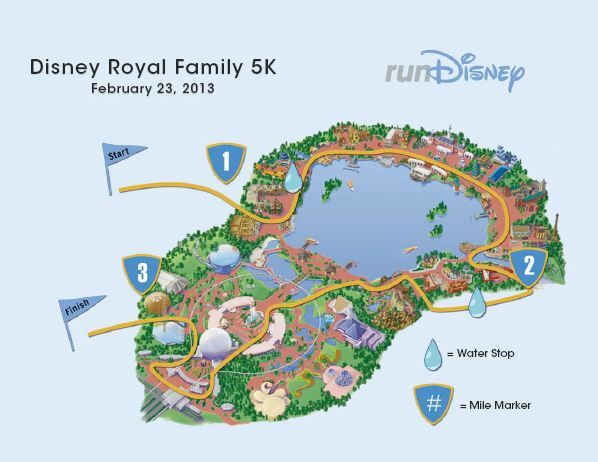 And you’ll find, that the distance between Disneyland and the California Adventure is a mere 100 yards. So, my family decided that we would see more of California. The most un-Disney that we got during the first trip was a trip to Beverly Hills; to see the address of Walt. This time, we’re going more towards the California side of California. Does that make sense? Image: a little. But, more LA and less Disney? Sophie: Yes. There’s not a problem with that. Is there? Image: No. But, do you think we can zero in on Disney? Image: Well, that wraps up the interview thank you for your time, Ms. Sophie. Tooddles! 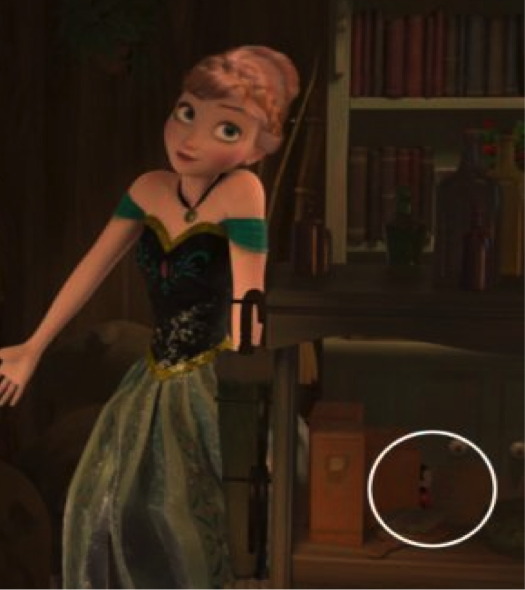 Q: Which Famous character made an appearance in Frozen as a stuffed animal? It’s okay if you got it wrong. That was an Easter egg question. You have to look very closely through out the film. But here is a clue. How people see that, I have no idea. But I hope you enjoyed my little interview with myself — I mean Mr. Image Reporter — and bye!!! 5) Epcot’s Akershus. It’s a restaurant in the Norway Pavilion. The characters there are Disney Princesses, such as Snow White, Sleeping Beauty, Cinderella, and Belle. By the way, did you hear that the Imagineers have taken out the ride in Norway? They’re going to replace it with a Frozen-themed ride. The Frozen ride had BETTER be at least twice as good. Or I’m going to be very disappointed in Disney. 4)The Beach Club’s Cape May Café. It was a long time ago, but I remember when we went to the Cape May Café for breakfast. It features Minnie, Goofy, and Donald. The food was delicious. Best cinnamon bun EVER! It was covered in icing, and warm. Just like the doughboy one’s we made at home, only bigger. Oh man, just typing about it’s making my mouth water. And I’m not kidding. 3)Magic Kingdom’s Crystal Palace. It’s nice to just walk into a giant Victorian-style green-house-like building. The Crystal Palace is home to the Winnie the Pooh characters. Every 15-20 minutes or so, they’ll host a parade. It’s not a sit-and-order restaurant. It’s more of a sit-and-wait-for-a-turn-to-go-to-the-buffet restaurant. That’s a mouth full. Try saying it five times fast. My favorite Winnie the Pooh character! 2) Epcot’s Garden Grill Restaurant. The Garden Grill is probably, the best built restaurant in Disney, at least in my opinion. Name another restaurant that spins, allowing you to look at a jungle, desert, prairie and more. The Garden Grill is built on top of a ride known as Living With the Land. This ride goes through the hydroponic gardens, where they grow all the fruits and veggies that are used, cooked and eaten in the Garden Grill. 1) Contemporary’s Chef Mickey’s. If you ask me, there is no better place to eat breakfast than at Chef Mickey’s. The buffet includes original breakfasts in a disney style. 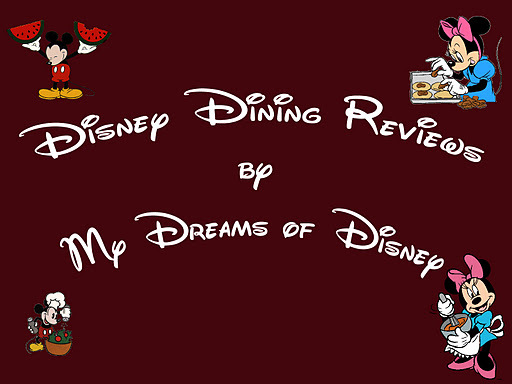 Mickey-shaped waffles, disney brand jam and the cinnamon role shaped like a hidden Mickey. I personally think this is the best of all character restaurants! Minnie Mouse makes a superior waitress! Sophie’s Favorite Attraction – Splash Mountain! Welcome to the first stop aboard Magical Blogorail. Enjoy the ride as we share Disney attractions reviews from our kids. The 52′ Drop from the top of Splash Mountain! Hello Disney Fans!!! 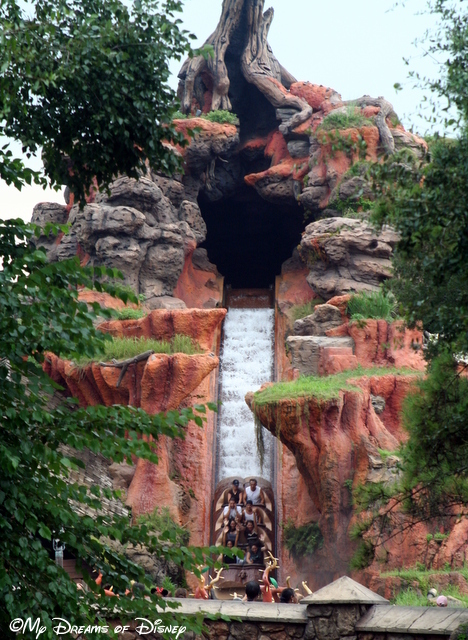 Today, I’m writing about my favorite attraction: Splash Mountain!!! Would you believe that for a long time, I was utterly, terrified of that drop? If you’ve been with us in an earlier time, then you know that story. If this is the first post you’ve read, kick back and let me type a story for you. It was in the trip of 2012. My parents and I were with a friend who loved Splash Mountain. One thing lead to another, and somehow, they convinced me to go and ride with them. It was the scariest thing for me! I was so paranoid that we would actually go into the briar patch! About half way through “the laughing place,” Daddy’s hat fell down and touched me. I. WAS. SO. SCARED!!! I thought it was an oversized queen bee about to sting me or something! I was screaming like bloody murder! The funniest part was when we were going up to the top. My mom was next to me, and she said that I was holding on so tightly, I was cutting off circulation. As we were going down the drop, I prepared for a lot of thorns. But, we didn’t go into the briar patch. I was like “AHHHHH!!!…. oh.” I saw that we went through a small tunnel. I was actually going under the briar patch! 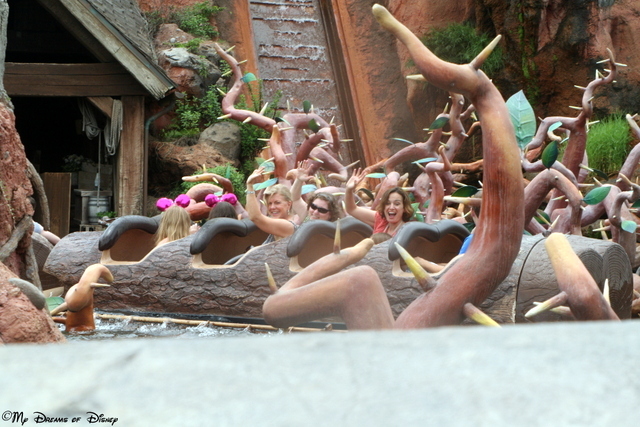 So now that i’m not afraid of the briars, I really like the ride, as you can tell from this picture of a group of us going on Splash Mountain (I’m in the pink Minnie Ears in the front on the right). Getting ready to ride Splash Mountain again! Thank you for joining me today. Your next stop on the Magical Blogorail Loop is Mommy to All Girls. 1st Stop – My Dreams of Disney – Sophie’s Favorite Attraction – Splash Mountain! 3rd Stop – For the Love of Disney – Top 5 Disney Rides for Kids… outside of Fantasyland!